Honey Bees are well-known as hive bees: semi-domesticated for thousands of years to produce honey for human consumption. They may form colonies in the wild in wooded areas. As with other colony-living insects, the hive is split into a queen who lays eggs, the workers who look after the young and the drones who are reproductive males. The hive is made of wax 'honeycombs', each divided into a number of hexagonal cells that are used to rear young or store food such as pollen and honey (which is actually regurgitated nectar). The larvae pupate in the cell which is capped by wax until they emerge. The first new queen to emerge may sting following queens to death and will either take the place of her mother (who will leave with a swarm) or will create a new colony. The familiar black and gold Honey Bee is almost unmistakeable; there are several species of hoverfly which look similar, but they can be distinguished by their larger eyes. 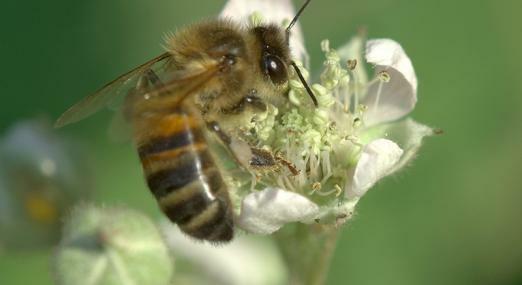 Honey bees play a role in pollinating hundreds of plant species, including many crops. Along with a wide range of less well-known native pollinators, they have suffered from the loss of wild flowers from the landscape. The Wildlife Trusts recognise the importance of healthy habitats to support all kinds of species, so are working closely with farmers, landowners and developers to promote wildlife-friendly practices. We have a vision of a 'Living Landscape': a network of habitats and wildlife corridors across town and country, which are good for both wildlife and people. You can support this greener vision for the future by joining your local Wildlife Trust.